Hello fellow gardeners, just wanted to let everyone know, especially the gardeners who have been with GAGA longest and know the Executive, that Mr. Harvey Nuelle our recently retired member of the GAGA Executive has just been honored by the TD Bank in appreciation of his outstanding community volunteerism with a donation in the amount of $5000.00 to the Elizabeth Bruyere Foundation. Harvey is a mentor for men who have been newly diagnosed with Prostrate Cancer and also helped with the elderly, frail and physically challenged client with Elizabeth Bruyere Continuing Care. 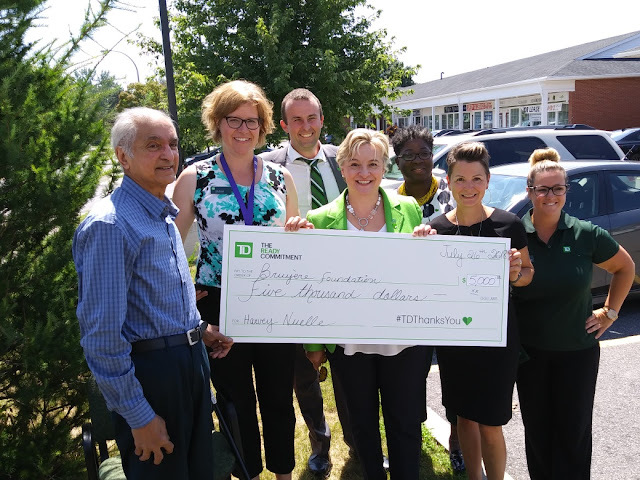 Harvey is the young gentleman on the left side of the photo next to the TD Bank executives who came out to present the check. Well done Harvey! Hello everyone! Hope that the heat we are currently experiencing is helping all of your tomatoe and pepper plants. Come on out to the Open House at the Organic Demonstration Garden on Sunday, July 22 from 1:00-4:00 featuring Tours of The Garden including the organic Veggie Patch, the Perennials Bed, the active Composters, the Drought Resistant Plants, Edible Flowers and Herbs for the Table. We demonstrate how gardeners can use organic methods to create and maintain an ecologically friendly and inviting garden. Don’t miss the Tours starting every 20 minutes or so, Photo Ops in The Garden, Kids’ Activity Table, Roving Musicians and Just Voices Choir singing at 3:00, Door Prizes, and Sips of Organic Lemonade. The Organic Demo Garden is located in the Experimental Farm on Prince of Wales Drive in Ottawa. On entering the parking lot to the Canada Agriculture and Food Museum, we are located beside the hedge on your right hand side. The only charge will be the cost of parking. All welcome! " Just a few pieces today. Please send the invitation to the Anniversary Celebration to your gardeners. You and everyone at your garden are invited to the Just Food Farm to Celebrate Just Food's 15th Anniversary! Parking is available on site, you can also get to the site by taking the # 94 bus on the transitway. A Repair Cafe with Ottawa Tool Library - if you need your garden tools maintained, sharpened, or fixed be sure to bring them!! Please extend the invitation to all your gardeners - we'd love to see as many of you as possible. If anyone would be interested in fixing tools for other - please let me know & I'll connect you to the Ottawa Tool Library. The dates for the Spring Meeting are now set they are as follows. Since the Network has been getting so large we are moving towards multiple meetings instead of one large one each season. Please RSVP to communitygardening@justfood.ca & I'll see you then. The agenda & previous minutes will be sent out the week of May 16th. If you are interested you could lead a Jane's walk in your neighbourhood! Every year Jane's Walk convenes close to 2,000 Ottawa-Gatineau residents (May 5th-6th 2018) to walk their city in a festival of community-led, free walking tours. The festival combines the simple activity of walking with observations, oral history, and shared experience. It gets people out into their communities talking to each other and learning about their City in new ways. The subject or area is completely up to you and you are welcome to share the role with others. You do not need to be an expert, but merely help inspire conversation. Generally walks are only 1- 1.5 hours. 5 stops and talking points are usually enough to fill up that time with questions! You can register your walk on the website or with Leigh Thorpe (Leigh Thorpe 613 563-4922 Jane@JanesWalkOttawa.ca), deadline April 12th. Garden Days June 16th- 24th Gardening is something to be celebrated! June 16th – 24th 2018 Garden Days, a program of the Canadian Garden Council, is a joyful, country-wide celebration of the role of gardens in our communities and in our lives. This nine-day program of activities and events is for gardening enthusiasts, families, schools and tourists alike. Garden Days is an opportunity for Canadians to enjoy their own garden, visit or take part in their favourite garden experience, get inspired at their local garden centre or travel to a nearby destination to enjoy their favourite garden. Just Food is hosting a Rain Barrel Fundraiser in Spring 2018, please share with your networks. You can start looking at what will be available at this link: https://rainbarrel.ca/justfood/, according to ranbarrel.ca they will be updating the page & launching it on March 22nd. Pick up for the rain barrels will be at Just Food Farm, 2391 Pepin Crt. on April 29th. If you cannot pick it up then, please let me know & I'll set it aside for you until a later date. The Community Garden Development Fund is taking applications. You can find the applications on this page on the Just Food website: http://justfood.ca/community-gardening-network/community-garden-development-fund/. If you are looking at an expansion, or an infrastructure enhancement project then this is a good opportunity to get a project going. If you have any questions, please send me an email to schedule a time to chat. Hello again everyone! Hope we have all shaken off the effects of our latest gift from Old Man Winter? If we are fortunate, this last ice event should be the last one for this Spring and we can get on with our gardens, or at least the preparations for our gardens. 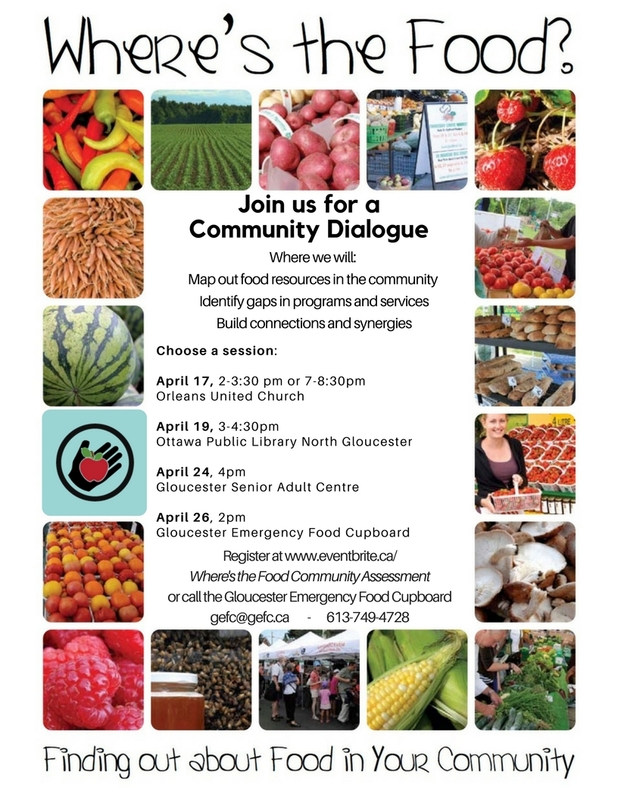 Please have a look at the poster below regarding food resources in the community. Hello fellow gardeners, I suspect that everyone is now getting a bit of the Spring fever and are raring to get out in the gardens especially after all of the recent warmer weather. But we must all wait a bit more. We hope this email finds you well. We are sending you this message to announce our arrival into our new office and program space at the Just Food Farm! To kick off our "Red Barn Series", we are hosting a potluck and seed saving workshop facilitated by Kate Green from USC, right in our very own space at the farm. 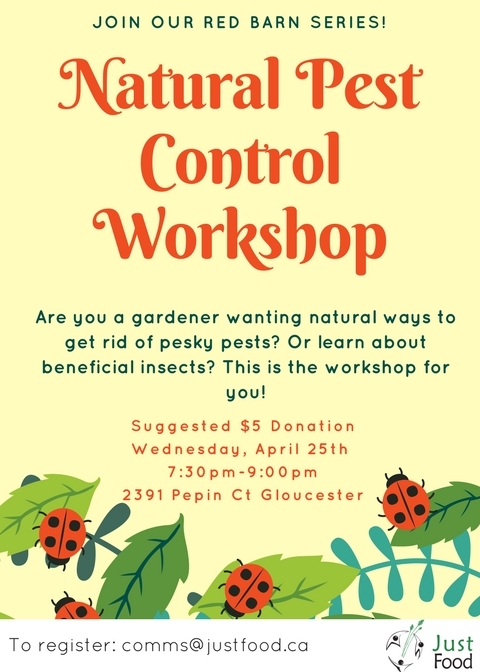 Where: Just Food Farm at 2391 Pepin Ct, Gloucester. As you all know, seed saving is an important facet of food security and we are so thrilled to have the opportunity to partner with great organizations to facilitate these awesome learning opportunities! I have attached the link to our facebook event, as well as our poster for distribution to your networks. Keep your eye on the Just food newsletter for other great workshop opportunities. And as always, do not hesitate to contact any of our team for more information! Garden Days, a program of the Canadian Garden Council, is a joyful, country-wide celebration of the role of gardens in our communities and in our lives. The program’s objective is to draw attention to Canada’s garden culture, history and innovations and to underscore the importance of public and private gardens, the values of home gardening and the promotion of environmental stewardship. We invite you to be part in this exciting national event! Le programme du Conseil canadien du jardin, les Journées du Jardin, se veut un joyeux événement à l’échelle nationale qui célèbre le rôle des jardins dans nos communautés et dans nos vies quotidiennes. L’objectif de ce programme est d’attirer l’attention sur la culture du jardin au Canada, sur son histoire et ses innovations. Aussi, les Journées du jardin se veut une occasion de souligner l’importance des jardins publics et privés, des valeurs du jardinage domestique et la promotion de la bonne gestion de l’environnement. Nous vous invitons à participer à cet événement national passionnant ! Theme images by funstickers. Powered by Blogger.